Yes, that’s the sound a clock makes. But “tick” also refers to the insect responsible for many persistent and serious infections, which is a “timely” issue for us here in the Adirondacks. Illnesses in children and adults, including flu-like symptoms, pain in muscles and joints, swelling of joints, fatigue, and fever, as well as the well-known bull’s eye red rash, were first noted in Lyme, Connecticut, in the early 1960s. The reasons for these maladies, a bacterium known as a spirochete, was not identified until the early 1980s. The incidence (or number of cases) of Lyme disease has tripled in the Northeast since the 1990s, resulting in at least 4,000 cases. 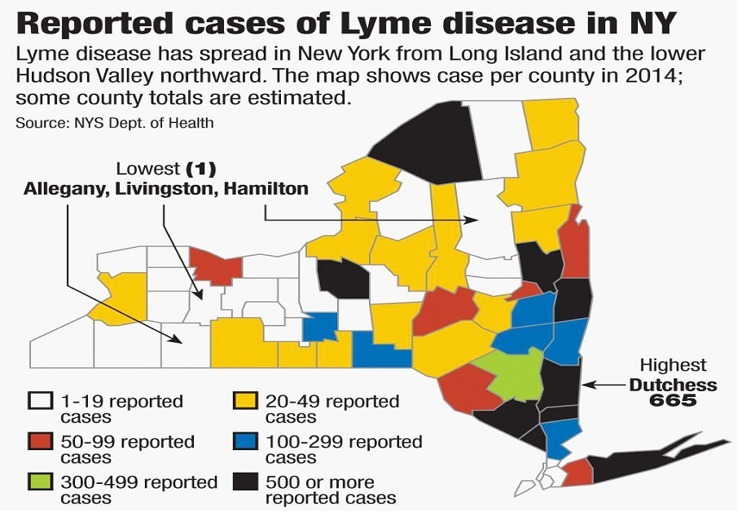 The below map shows the incidence of Lyme disease in NY State. Unfortunately, the Adirondacks have seen more than a twenty-fold increase in the same time period. Reasons include warmer winters that allow survival of the tick’s primary targets—no, not us, but mice and deer. Ticks are born disease-free but become infected when they feed on mice which carry the bacterium that causes Lyme disease. Treatment for Lyme disease, because it is a bacterial in nature, is based on the use of antibiotics. 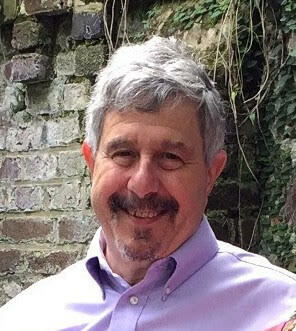 However, controversy exists over whether short- or long-term therapy is required to cure Lyme disease. Obviously, your doctor is the expert, not me. Since the symptoms may not appear until thirty days after infection, it is often difficult to remember the initial insult and thus begin appropriate therapy. Of potentially greater concern, months or even years may pass after infection, and meningitis (swelling of the membranes surrounding the brain) may occur, resulting in possible neurological consequences including numbness, paralysis of facial muscles, and severe headaches. The second, and perhaps more worrisome, tick-borne disease in our area is known as Powassan (POW) virus. It is related to West Nile virus and was first noted in Powassan, Ontario, in 1985 when a five-year old boy died of seizures. Although not all victims of tick bites develop POW, the unlucky few who do may begin to show symptoms one to four weeks after infection. Symptoms include high fever, headaches, confusion, loss of coordination, speech difficulties, seizures, paralysis, coma, and even death. Since 2000, there have been only 24 cases of POW reported in New York State, so this worrisome tick-borne virus is rare. But a resident of nearby Saratoga County who died this past July had high levels of POW antibody—a specific marker of POW. Unfortunately, there are no vaccines or medications either to prevent or treat POW. If you or a loved one have symptoms described above, CALL YOUR PHYSICIAN IMMEDIATELY! Those infected will be hospitalized and given intravenous fluids and respiratory support, if necessary. Before my clock runs out of time on this article, please remember that the best tick repellent is following these steps both before and after walking or hiking in areas that may have ticks. Please do not stop hiking and enjoying the beauty of the Adirondacks because of concerns over tick-borne diseases—just be careful and follow the guidelines to prevent ticks from feeding on you!